I got mine replaced at the dealership and it had a rubber type washer now to hold it in better. Seems to be working okay so far. Mine came with the rubber grommet/washer along with a metal clip. 500+ miles and it seems to be holding on. What happens to the power when this come off? When I was in the local dealer shop two weeks ago to get rear brake rotors turned, they told me there was a new "recall", and they would order the parts. The shop manager said something about a bolt breaking, causing an electrical short and possible fire. I took the car in today for the fix, and it was done in 5 minutes. Now I have a metal clip "nut" on the bottom, a metal bolt, and a metal keeper clip on top of the bolt. I don't have any TSB or recall information, or parts numbers, but there is a proper fix. Pester your dealer! When I went in for an oil change yesterday, my dealer also mentioned this recall. The parts were ordered and it is going in next week. He said it would take ~45 minutes however. I was in the shop at 9:45, and out before 10:00. Their rate probably says 45 minutes, but it's a quick fix. If I just bought the car yesterday (new but it's been on their lot for months)would this recall have been done by the dealership at the time of delivery? Or is this something I need to look out for? They are supposed to do it on all inventory, but it is a pretty new recall, and they may have had to order the parts. Ask the dealer, and look closely at the bolt that holds the left charge pipe to a bracket over the motor, near the high pressure fuel pump. If it is plastic, they haven't done it. The repair is a metal stud, clip "nut", and spring clip keeper on top of the bolt, all metal. Thank you for the help, I'll go take a look at it tonight. Mine has the black stud but no retainer clip... does that mean mine has the newer stud? normal? There are also no clamps on that side..? dLooks like you need the recall work done. The stud should be a light grey color, with a black retainer over the top. General Motors is announcing Service Update Bulletin 09126 today. The total number of vehicles involved is 6,756. This bulletin provides a service procedure to install a new stud and retainer on certain 2008-2009 model year Chevrolet Cobalt SS and HHR SS vehicles equipped with a manual transmission. On these vehicles, the charge air cooler inlet duct may become detached and contact the high pressure fuel pump connector. This contact could eventually cause damage to the connector, causing the fuel pump to become inoperative. If this were to happen, the Engine Power Reduced message would illuminate in the DIC and the maximum vehicle speed would be reduced to 20 mph (32 km/h). Bulletin 09126 will be available in SI on July 22, 2009. GMVIS information will be available on July 22, 2009. The Inventory VIN List will be available in the SUB link on July 22, 2009. THIS SERVICE UPDATE INCLUDES VEHICLES IN DEALER INVENTORY AND CUSTOMER VEHICLES THAT RETURN TO THE DEALERSHIP FOR ANY REASON. IT WILL EXPIRE AT THE END OF THE INVOLVED VEHICLE'S NEW VEHICLE LIMITED WARRANTY PERIOD. This bulletin provides a service procedure to install a new stud and retainer on certain 2008-2009 model year Chevrolet Cobalt SS and HHR SS vehicles equipped with a manual transmission. 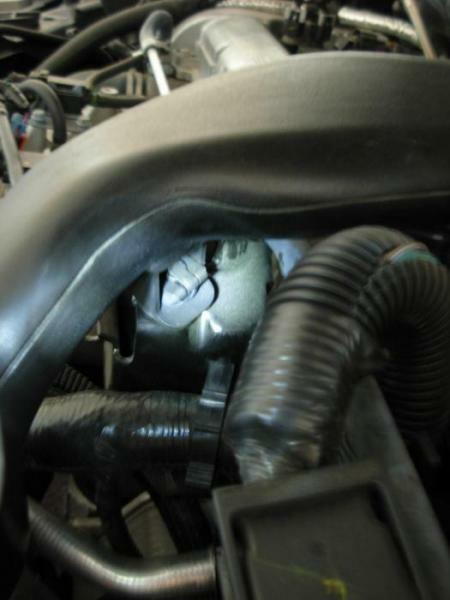 On these vehicles, the charge air cooler inlet duct may become detached and contact the high pressure fuel pump connector. This contact could eventually cause damage to the connector, causing the fuel pump to become inoperative. If this were to happen, the Engine Power Reduced message would illuminate in the DIC and the maximum vehicle speed would be reduced to 20 mph (32 km/h). A list of involved vehicles currently in dealer inventory is available on the "Service Update Bulletin Information" link under the "Service" tab in GM GlobalConnect (US) or attached to the Dealer Communication (Canada) used to release this bulletin. Customer vehicles that return for service, for any reason, and are still covered under the vehicle's base warranty, and are within the VIN breakpoints provided below, should be checked for vehicle eligibility in the appropriate system listed below. Important: Dealers are to confirm vehicle eligibility prior to beginning repairs by using the GM Vehicle Inquiry System (GMVIS). Not all vehicles within the above breakpoints may be involved. I' not sure I see what you are talking about. There is a substantial indentation on the side of that pipe, right before the flex hose connection. There is no obvious clamp on the connection to the flex hose. Yup.. thats what I was referring to. And that there are no obvious clamp is also normal? if I should ask the dealer to replace pipe. I have only had my SS for 6 weeks, so I'm no expert. However, I believe that's right. Got mine fixed today. Looks good, they told me I got to replace my rotors, so I'll have to find the info on that so they can do that also. Guys, I shattered my intercooler on 26PSI and still haven't had a single problem with the charge piping... 5k miles on the car, 4500 miles since I've been running 26 psi. ****, with two friends and our luggage on the way to the LSFest this year, the car hit 30 PSI... (I detuned it back down, don't worry, I wouldn't leave it at that, but it DID happen ONCE). I'll go take a look... I must have that clip or something. I'm not having any problems. Well, except the blown up intercooler. I guess that means GM's fix worked then huh? You know what I find really sad about this thread? Honestly. The stock charge piping is a joke. After market piping is definitely what's up. To be honest, I'd get that before anything else. what is that black condom peice on the screw? I just bought a used 2010 SS from a Chevy dealership, and was wondering if the 2010 models already have this fix or not. They are closed today, so I can't drop by to take a look. ^^it was for (all) 2008 & some 2009 model year cars.